Who could fail to love the Zeus Temple, you will feel like a Greek god here! One look at the pool area of the Zeus Temple will have you falling in love. It has been designed to look like an old Greek temple of the gods but it also has a real modern feel to it. When you step foot inside you will see a stunning interior, carefully designed with luxury and comfort in mind. 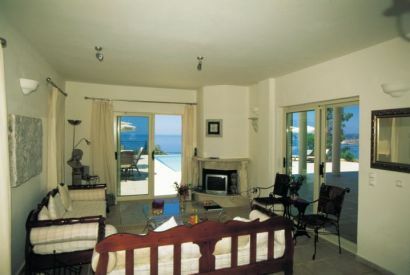 Outside is an infinity swimming pool which overlooks the sea and a stone terrace ideal for reading a book in the sun or dining al fresco on the evenings. A great place for a holiday stay! 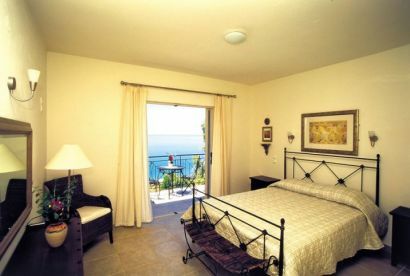 included if you book this accommodation as part of one of our Thomson Holidays packages. This is our 24-hour phone service. You can use it to book days out, find out the local bus times and let us know about any problems that crop up. Prefer to speak to someone face to face? You can call us to arrange a personal visit too. 1. You can check the Zeus Temple availability and package prices at Thomson Holidays. 2. You can also book and check prices at Zeus Temple with First Choice the cheap holiday specialist.